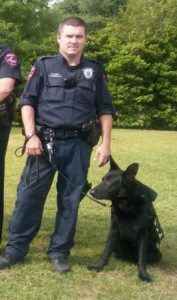 The Smithfield Police Department has retired K-9 Officer Argo from the force. Argo is 9-1/2 years old and has been with the department the past 8 years. His handler, Master Police Officer Kenny Hundley submitted his resignation to the department effective July 24th. According to current police guidelines, most K-9’s have a useful field life of 6 to 7 years. Argo recently began to experience issues with his hips and began to show signs of slowing down. 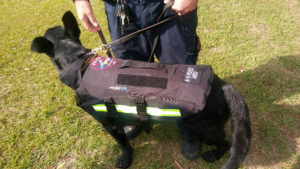 The cost to retrain Argo with a new handler would cost as much as $3,000. Police Chief Keith Powell recommended against the retraining due to Argo’s age. Chief Powell said Officer Hundley has agreed to take Argo as a family pet. In a formal vote, the Smithfield Town Council approved the retirement of Argo and allowed him to retire with his handler. The Police Department is now looking to replace Argo. The plan is to use Forfeited Funds to purchase and train another K-9 at a projected cost of $13,000. Smithfield has one other police K-9 on the force.